If you have watched the latest controversial video of Kagiso Rabada and Steven Smith, you would have observed that as soon as Rabada brushed his shoulder against Smith, the latter immediately involved the on-field umpire. The incident was taken up seriously and by the end of the day, match referee Jeff Crowe had charged Rabada with a level 2 offence, which was later reduced to a level 1 offence. Beyond this, there were no words exchanged; the matter was handled in the correct way. Although Rabada appealed successfully against the charge, getting it reduced so he does not miss the third Test, at least the incident did not taint the aura of the Test like the David Warner-Quinton de Kock controversy in the opening Test in Durban. Let's rewind and go through the controversy that surrounded Australia's vice-captain Warner and South Africa's de Kock. On the final day of the Test, the CCTV footage showed a fired up Warner going after de Kock during the tea break. The whole scene, which took place on the staircase to the dressing rooms, certainly looked ugly on camera. Based on the footage, Warner's teammate Usman Khawaja had to hold him back before Captain Steven Smith pulled Warner away. Although the CCTV footage had no audio, later Smith revealed that de Kock had apparently made some derogatory comments about Warner's wife, Candice, which enraged the Aussie batsman. While South African skipper Faf du Plessis did not deny that, South Africa’s manager accused Warner of instigating de Kock in the first place. He said, when de Kock was batting on the final day trying to save the Test, Warner tried to get into de Kock's skin by making some inappropriate comments about his sister. The incident spread like a forest fire across the social media and took up most of the post-match press conference. Isn't that sad? The Test involved two of the top sides in the world and they put up a contest that was nothing short of brilliant. These days, cricket has become more of a batsman's game, so whenever the match revolves around the genius of bowlers, it is always special. The Durban Test will be remembered for Warner-de Kock's controversy, but it should be remembered and cherished for Mitchell Starc's nine wickets, Aiden Markram's fighting 143 during a crisis, and an excellent fightback from the hosts before they finally fell apart. The journalists fired one question after the other about the controversy at Smith. Finally, towards the end, when he was asked about the team's bowling effort, laughter broke out in the room. If only they could find the tears of Test cricket hidden behind that laughter. Test cricket is supposedly dying. If incidents such as these continue to overshadow the game, it will get really difficult for the format to survive. The limited-overs versions can always offer you something like this, so why would you give five days to the sport? If the ICC has made its rules and has given certain responsibilities to their officials, called umpires, the rules must be followed. Test cricket needs to be clean in order to survive amidst the severe competition from the shorter formats. It is fair to say that only de Kock and Warner knew the truth about who said what, but the significant point here is that if there was unacceptable sledging on the field, why didn't the umpires intervene? Why did they let the situation get out of control? Last year, the ICC approved penalties for offences like dissent, intimidation and assault. The punishments varied from a five-run penalty to a player being removed from the game. Umpires must be encouraged to use the authority given to them and come down hard on the players. This way, the fear of losing a player or the captain himself will ensure the players never repeat mistakes. Suppose Warner did try to get personal with de Kock in the session before tea; de Kock should have immediately informed the umpire about it. 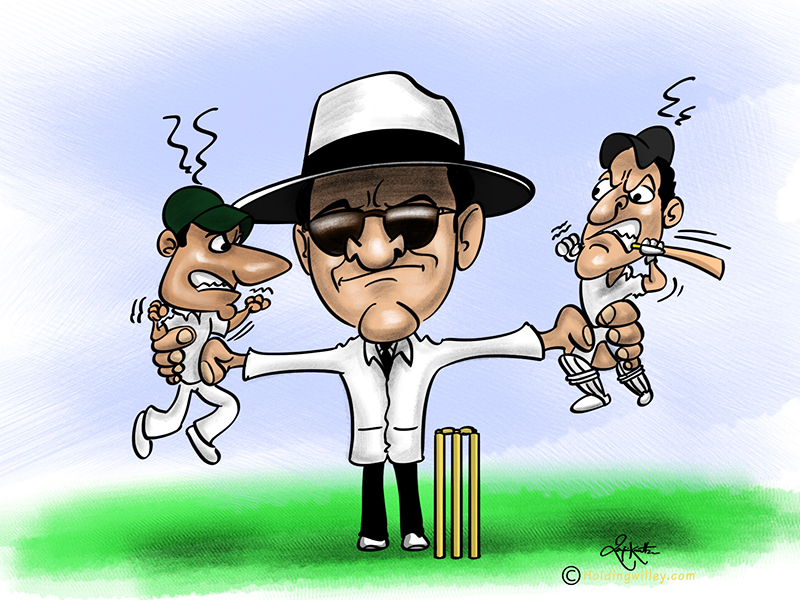 The batsmen must be allowed to report to the umpire any unwanted verbal that disturbs their peace at the crease. In fact, all players must be encouraged to do so. Stump mics were introduced to reduce the burden of the umpires, but always depending on technology might not be a great idea. Something that could be stopped there and then would end only after a session or innings ended. Let’s consider another possibility in the Durban Test. For once, we could accept that the on-field sledging somehow escaped the umpires' notice. But, they could have easily handled the staircase incident. A team is under the control of their management when they are among themselves, away from any other team’s people. But anywhere outside the dressing room, it is the duty of the game's administrators to step in. Just chanting terms like "spirit of cricket" will not protect the game from such unwanted events. The players and the administration have to work together towards it. If the players lose track of things in an intense moment, it is the job of the administrators to play the support role. It is high time umpires begin to play a more prominent role in order to keep the game clean.